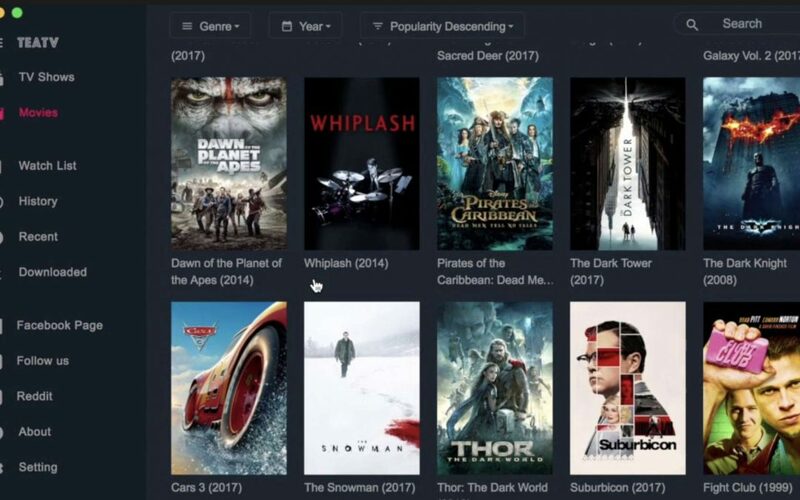 The Tea TV mac app is a great premium themed free app to stream the latest movies and TV shows on any device running on the Mac OS. This app works on your MacBook or MacBook Pro, Mac mini, etc. TeaTV is one of the few free Movies and TV shows apps that are supported by the Mac OS! Pro Tip: If you want to install another great streaming app on your Mac, also check out Popcorn Time for Mac (link). Or install Tea TV on Firestick! If you want this great app to installed on your Mac device, then follow the below mentioned simple steps. Or watch the YouTube video immediately below. Then you’re good to go. Let’s quickly go through the steps to install TeaTV Mac version. In order to watch free Movies and TV shows on your Mac device, you will first have to download its Mac supported version from their official website. Here are the steps to download the Tea TV file on your Mac. Open the Safari browser on your Mac device. Type or copy paste this link in the search bar: “teatv.net” and press enter on the keyboard of your Mac. This should bring you to their website. Once on the official Tea TV website, press the download icon on the top right-hand side of the screen. Scroll down on the website and select the “Tea TV for Mac OS” this should begin the downloading process. To install TeaTV for Mac, click “Download TeaTV.dmg” after you arrive at the page in the screenshot above. The TeaTv.dmg file should be downloaded in the next 20 to 30 seconds. Once the download is complete, you now have to install the file on your Mac device to begin watching the free Movies and TV shows. By the way – Tea TV exists for Android (and Fire TV / Firestick), Windows devices, and Mac devices (like Macbook, Macbook Pro, Mac Mini, etc). So, we’ve downloaded the Tea TV app, now let’s install it by following these simple instructions. In your browser, click on the bottom left side where the downloaded file is showing. This should verify the file. After the verification is done, Mac will show us another window that actually allows us to install the Tea TV app On the Mac device. You should see the “Tea TV icon” and the “Application folder” in that window. Click on the Tea TV icon and drag it over to the Application folder and release. This would start the “Copying Tea TV to applications” process. Just click “Open” to proceed to the Tea TV app we just installed. Once inside the Tea TV app. You will see a ton of movies and TV shows. You can choose any one of them to watch for free. The Tea TV creators have mailed the search function. The function allows you to search multiple sources of a specific movie. You can select the quality and language of a Movie you want to stream on the app.